Slice zucchini in half lengthwise. Hollow out the inside flesh of the zucchini leaving about a 1/4-inch border. Chop scooped out zucchini and set aside. Heat olive oil over a low medium flame in a sauté pan. Sauté garlic and onion until translucent; approximately 5 minutes. Add ground turkey, breaking it apart with spoon. Season with salt, pepper and cumin. Stir in tomato, zucchini flesh, jalapeño and cilantro. Cook for 10 minutes more or until turkey is no longer pink and cooked through. Divide mixture evenly among zucchini boats and sprinkle with cheese. Bake uncovered for 25 minutes. Remove from oven. Keep warm before serving. Use ground chicken or beef for a flavor variation. A quick lunch doesn’t have to be lacking in flavor or wholesomeness. Stuffed zucchini boats are the perfect veggie-packed lunch without the effort. 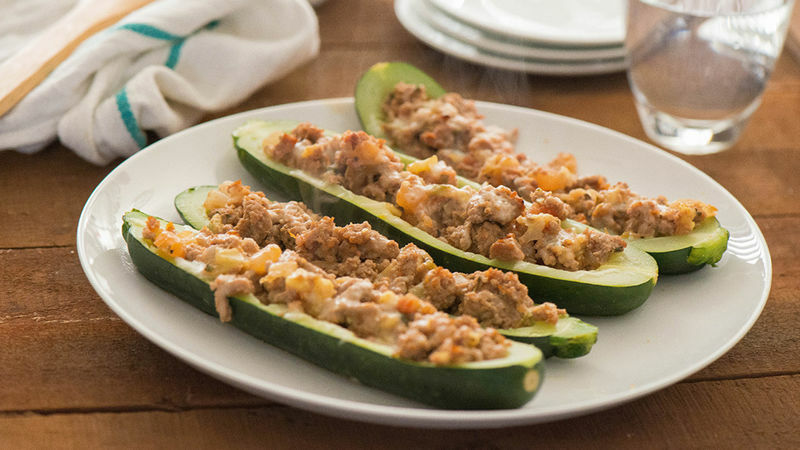 Make these simple, turkey stuffed zucchini boats with a side of your favorite rice or grains for your next office lunch or family picnic.